Planning on dressing up as the most feared pirate in the seven seas? Maybe you want to be a prisoner on the run after an epic jailbreak. 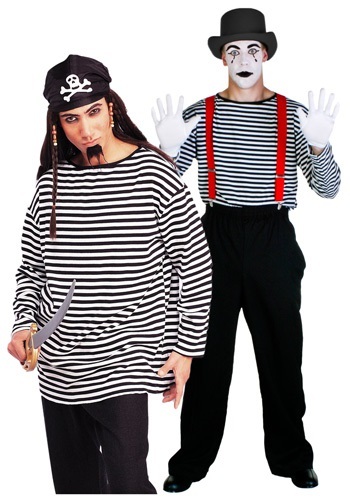 Or perhaps you really want to show off your amazing miming skills this Halloween. Well before you can do any of that, there is one thing that you absolutely need. Check out this awesome Striped Costume Shirt! This shirt will be a perfect addition to a variety of different costumes. So if you’re someone that doesn’t like to spend a whole lot of money for one night, this shirt will be perfect for you! With this one shirt, you have an amazing base to work off of. You can surprise all of your friends this year when you switch costumes three times in one night! Just take a look at the rest of our accessories and find a few fun and defining props to add to this Striped Costume Shirt. You’ll be ready to make plenty of quick and easy transformations for this coming Halloween season!